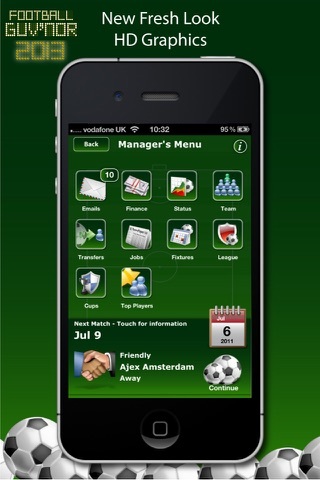 "Full of all the options you want and impressively deep for an iPod Touch/iPhone game"
Football Guv'nor ( formerly Soccer Manager ) allows you to take control of a top European team and guide them to league and cup success using your managerial skills. Choose any team from the top two divisions of six European countries. Buy and sell players, negotiate contracts, deal with your chairman on your path to glory. Qualify through playoffs, get promotion, win the premier division, qualify and win European competitions in order to fill your trophy cabinet. Your status will record historical achievements even if you change jobs. Use the information from your staff to help pick the team, deal with injuries and suspensions, whilst fending off the opposition from poaching your players. View detailed information about your player's skill, statistics and contract, all in a simple to use interface. Play pre-season friendlies to help prepare your team for the upcoming season. Use the training schedules to help improve your squad. Adjust your strategy, formation and tactics to outwit your opponent. Full match day statistics, commentary and real time scores from other fixtures help you during the match. When the match is not going to plan then you can change your tactics or strategy during the game and make substitutions. View the fixture lists, league table cup draws and much more. If you fancy a new job then check out the jobs market. Check out the transfer list to identify and strengthen your squad. Watch the financial statement and charts. Its the greatest job in the world. Have you got what it takes? I love this game!!! I wish there is another app just like this except for in hockey.